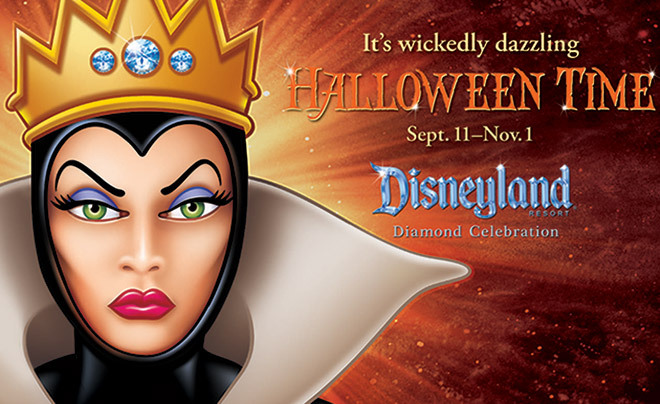 The Diamond Celebration takes a wickedly fun turn with the arrival of Halloween Time at the Disneyland® Resort, September 11 through November 1. Creep on over and meet up with the Disney villains—plus Mickey Mouse and some of his Disney Character friends, all dressed up in their Halloween best. And be sure to check out special fun in Disneyland Park like Haunted Mansion Holiday, Space Mountain: Ghost Galaxy and, on select nights, Mickey’s Halloween Party*. For even more “treats,” head over to Disney California Adventure® Park where the staff of The Twilight Zone Tower of Terror™ is positively dying for you to drop in. Of course, that’s all in addition to the dazzling entertainment created especially for the Diamond Celebration—including the electrifying Paint the Night Parade, unforgettable Disneyland Forever fireworks spectacular and the all-new World of Color: Celebrate! The Wonderful World of Walt Disney. So don’t miss Halloween Time at the Disneyland Resort this year—it’s a frightfully delightful way to celebrate 60 years of The Happiest Place on Earth! Please note: This year, Mickey’s Halloween Party will include the “Paint the Night” parade and “Halloween Screams” fireworks. Mickey’s Costume Party cavalcade will not be featured this year; “Disneyland Forever” fireworks will be presented on non-party nights.